When it comes to sharing data and documents quickly between iPhone and PC or Mac, the USB cable is our first choice. But what if iPhone XS Max keeps beeping when on charge or connected to PC or Mac while sharing data? In such a situation, we can’t share or charge the device smoothly with that continuous beeping sound. Also, This problem persists because of Disconnecting the connection between your iPhone and Electric power. That’s the reason you can’t take a backup, Restore or Charge your iOS device in Expected time. 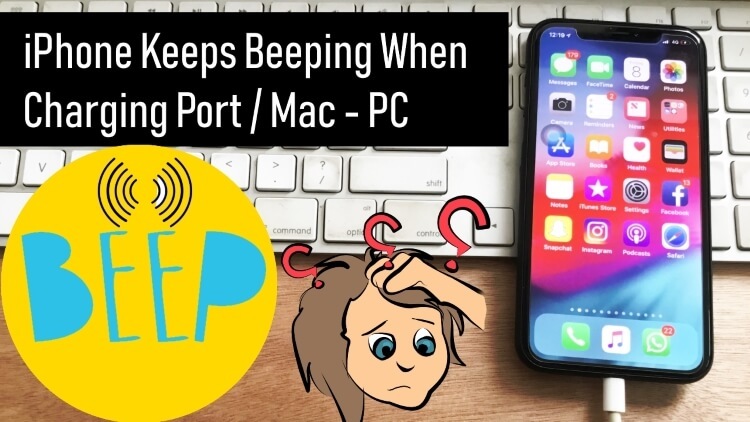 In this tutorial, we have presented all the possible solutions to get rid of beeping sound in iPhone XS Max while charge or connecting to PC or Mac. Let’s move forward to fix. If iPhone XS Max keeps beeping when connecting to PC or Mac then you must try to disconnect and reconnect the cable from the PC or Mac. The problem might get fixed if any minor glitch affecting your device. Alternatively, try to make sure your device is connected properly into the laptop. You should connect iPhone directly to the USB port of PC or Mac. Remove the intermediate device like USB-hub if any. Moreover, it may result in such errors if you are using a third-party USB cable, so prefer original Apple Lightning Cable. Step #3: Lastly, Only hold down the Side button until the Apple logo appears on the screen. iPhone XS Max keeps beeping when connecting to PC or Mac while using iTunes, the updating iTunes to latest version might be helpful. Once you update the iTunes, try to connect the iPhone to the PC and see if the problem persists. To check for iTunes Update follow the link. Remove all the accessories except mouse and keyboard from the PC or Mac. Only connect the iPhone to your desktop to check if any third-party device is malfunctioning the connection between iPhone and PC. I think the issue has gone wild, now we have one last option that is to contact Apple Support. They will perfectly examine your iPhone XS Max and bring you a quick solution. Other Possibilities why My iPhone XS Max keeps beeping while trying to charge or connecting to PC or Mac. The USB port of PC or Mac might be causing that continuous beeping sound on iPhone XS Max. Frequent water damage can also result in such issues. If you are performing Factory Reset on your iPhone, then kindly backup your iPhone to prevent data loss. Step #3: Scroll down and tap “Reset”. Step #4: Select “Erase All Settings & Contents”. Step #5: Enter the Passcode if asked. After Erase your iPhone, You can copy all the data back on your iPhone using Restore Process (Restore iPhone). Hope you got the fix from this article, also share your feedback and comment if you are stuck with other issues. We also cover all types of iPhone troubleshooting tips and tricks.